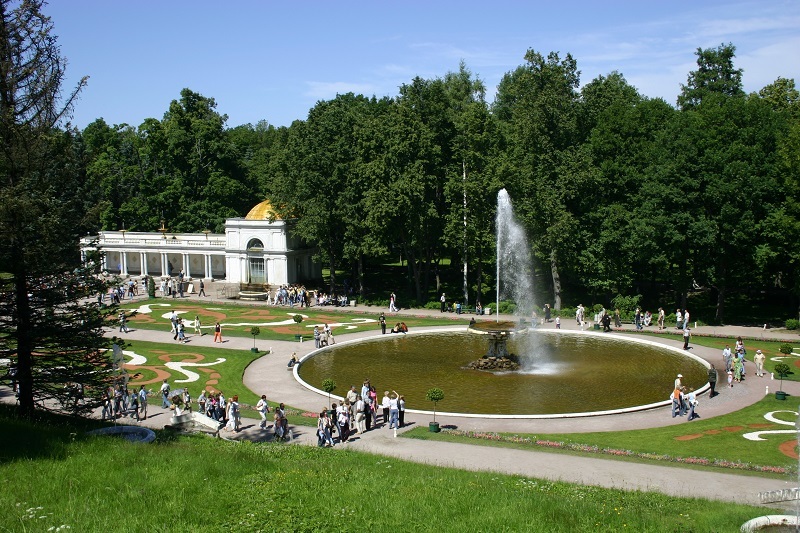 Petrodvorets is famous not only for its fountains, palaces and pavilions, but also for beautiful parks and gardens. 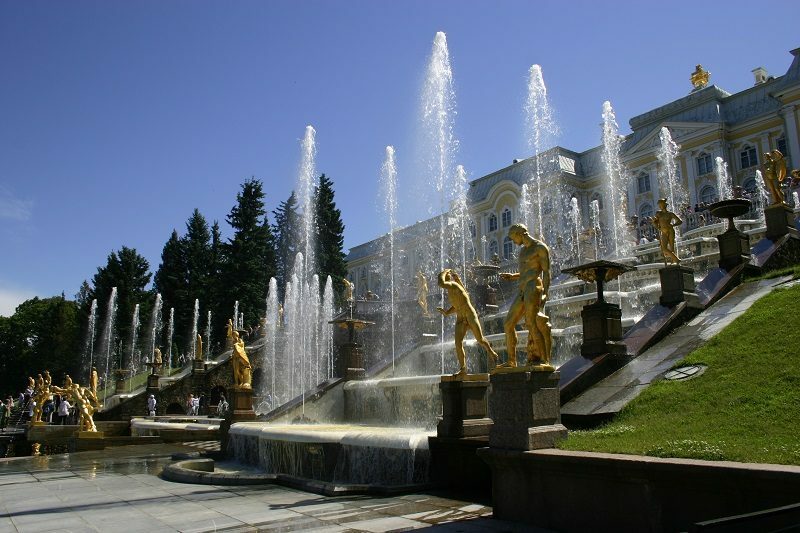 Many visitors, walking on Peterhof, at all do not suspect, that move from one park to another. Some gardens, for example, Chinese, bizarre design are recognized immediately, and some resemble a forest or grove with paved alleys along them, but nevertheless these are also landscape parks. Petergof can be conditionally divided into the Upper Garden and the Lower Park. The bottom park is rich fountains and royal buildings. 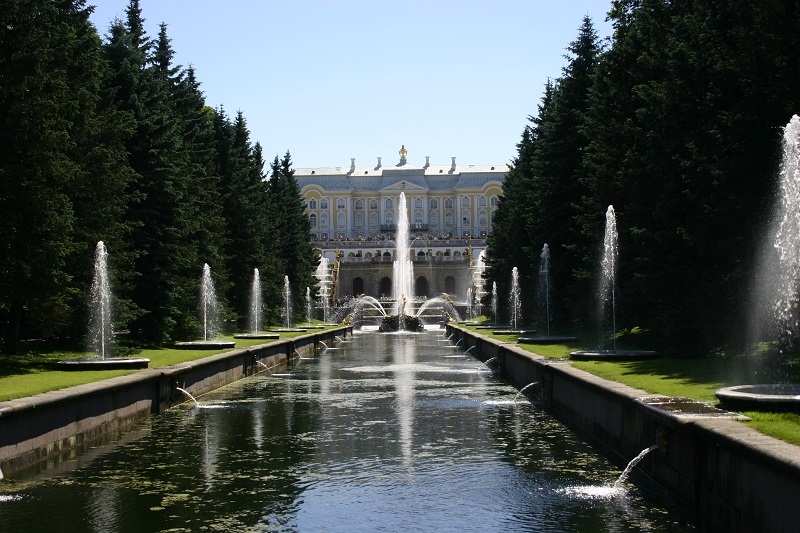 It houses the palaces of Marley, Monplaisir, the Hermitage, Samsonievsky grotto. From the fountain structures - Managment fountains, Lion cascade, Gold Mountain, Fountains-Closches, Roman Fountains, Chess Mountain. In the Upper Garden, the main dominant tower is the Grand Palace, in front of which the magnificent carpet spread alleys and flower beds of the Upper Garden. Its initial layout was was carried out in 1714-1724 by the architects Braunstein and Leblond. Clear lines of avenues, the green of the shrub-cut bushes and trees, the blue of the fountain ponds, create it quaint and exquisite ornament. 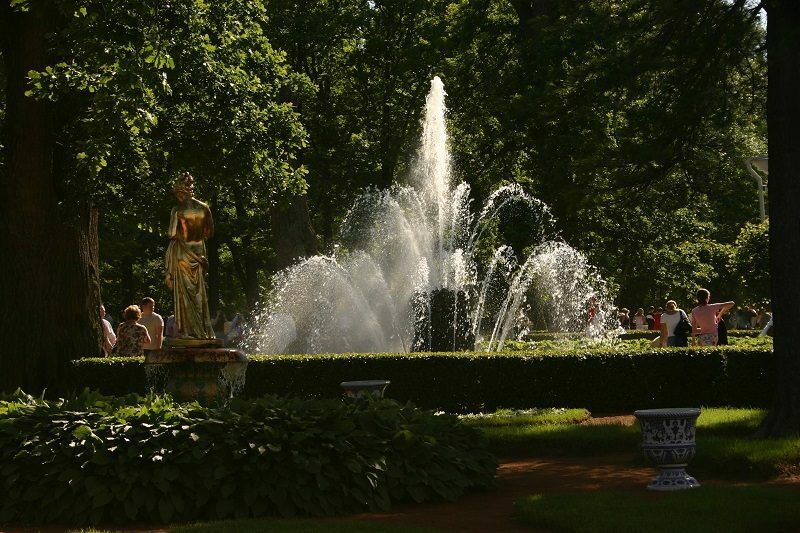 The real decoration of the Upper Garden is the fountain Neptune, located in the center of the pond. A living decoration was for the Monplaisirsky Palace spread out before him Monplaisirsky garden. Peter I himself chose trees and bushes, which were destined to grow here, himself drew drawings of the garden. Already in 1718, limes, maples and chestnuts were planted here. Decorated avenues painted with blue cobalt vases with thermophilic exotic plants. On exquisite floral carpet settled golden antique gods - these are 4 fountains-bells, over which set the sculptures of the Faun with a cup, Psyche, Apollo and Faun with a kid. Near the sea terrace Monplaisir is a Chinese garden. From the piercing winds it is carefully preserved by the walls of the buildings surrounding it. To the garden master Baltazar, who planned a garden designed by E. Ghana, managed to create a small, but surprisingly beautiful model of the whole fairy-tale world. The rules for the creation of landscape parks, which required the following natural samples, led to the birth of a tiny corner that contained, it seems, all the earthly beauty. A waterfall streamed from the fountain "Shell", a miniature rock massif steel blocks of tufa. In the midst of lush greenery and variegated flower beds, the river is fast flowing. A small sea stretched, excited by the falling spray on it, pond. The magic country of the Chinese garden was decorated with humpbacked bridges, painted oriental vases and shining white snow statues - copies of the works of the famous Italian master A. Canova. On the shore of the bay, under the protection of an earth-filled bulkhead and a stone wall with a balustrade, niches and figurative staircases is the garden of Venus. Elegant walking paths in surrounded by greenery from all sides rush to the statue of the goddess of love in whose honor and was this amazing romantic corner of the park is named. In the eastern part of the garden of Venus in the XVIII century there was a large trellis pavilion, and in the west a dovecote. The Great Cascade. 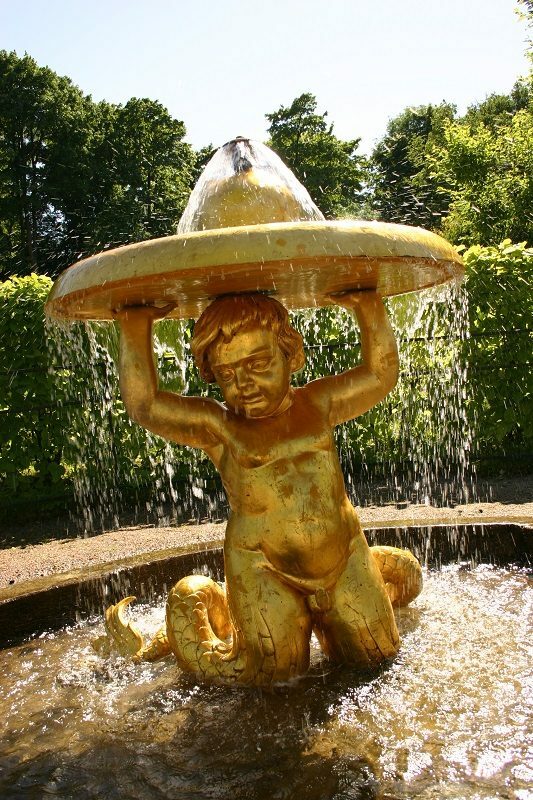 The composition of the fountains is a statue of the boys-newts, holding the discs over their heads. In the center of each disc, the fountain forms a bell shape. In Russia appeared a lot of exotic plants and lush foreign flowers, which were to decorate the new European fashion parks . In those days, none The regular garden did not do without the pavilions of the greenhouses. Pavilion Orangery in Peterhof architect Braunstein added elegance, full of sophistication and luxury of the XVIII century. Here, To protect against the changing northern weather, young flower seedlings trees, and only after they got stronger, they planted in the open air. 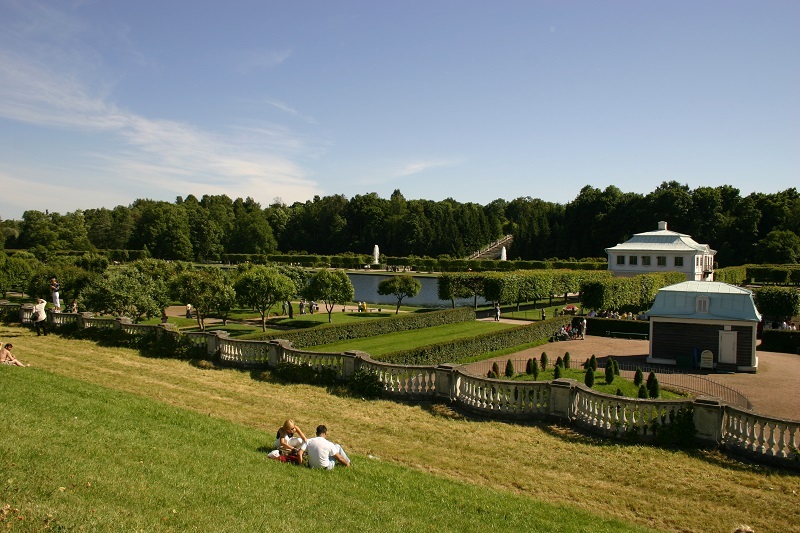 Hunting grounds "Yagd-Garten" near the Great Peterhof Palace were donated Emperor Alexander I to his brother Nikolai Pavlovich and his family. Spouse of Nicholas, Alexandra Fedorovna, was very fond of the sea views of Peterhof, but in the grand royal residence felt uncomfortable. Because it was decided to build a quiet and secluded suburban The estate with an adjacent park, named after its owner, Alexandria. Under the guidance of the architect Menelas, the well-known garden master. One of them - Peter Ivanovich Erler, many years later was buried here. In the park you can meet with a miracle the surviving Gothic well - a symbol of a bygone era . The romantic view of the park was enhanced by such decorative details as the ruined bridge, built Menelas near the former former Menshikov Palace Monkuraz. In this place, with 1826 Nicholas I ordered to build a house in English style with all household buildings that are called "Cottage".